The Belvidere-Boone County Explorer Post #2009 presently has approximately 46 members ranging in age from 14 to 20. Officer Thomas Jones is the advisor for the Belvidere Police Department. Sergeant Arnold Mariani, Detective Candy Bunk, Deputy Dave Gallano are the advisors from the Boone County Sheriff Department. The Post meets on the third Tuesday of every month at 6:00 pm at the Public Safety Building, in the training room. During these meetings we generally have some type of police related training taught by an officer or deputy who has experience in that particular field. Examples of this training include traffic crash investigations, traffic stop procedures, building searches, crime scene processing, domestic disturbances, first aid training, police communications and other topics. Each explorer is expected to attend all meetings and participate in special events throughout the year on a regular basis. When applicable the explorer is allowed the option of riding along with the advisors from the city or county while they are on duty. Explorers also have a police style uniform that is expected to be worn at all times when participating in special events. The Explorer Post provides assistance to the Belvidere Police Department and the Boone County Sheriff Department by helping officers' and deputies with security and traffic control within the city of Belvidere and Boone County during the Boone County Fair (assisting the Boone County Sheriff Department), all city parades and most of the special events such as the Home Town Christmas celebration and Police Week at the Cherry Vale Mall. 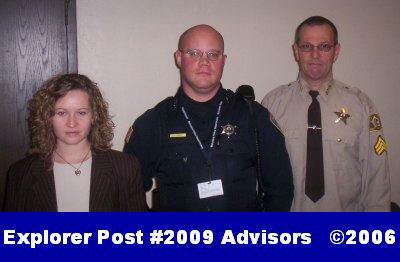 Individuals wishing to obtain information about the Belvidere-Boone County Explorer Post #2009 may contact one of the advisors listed above at the Public Safety Building at 615 N. Main St. in Belvidere, IL. 61008. You may also go to the National Explorers website at www.learning-for-life.org/exploring for more information. To leave a voice message for a city or county advisor please call the following numbers: 815-544-9626 for city advisor Officer Jones (#60). To contact county advisors Deputy Ryan Smith call 815-544-9322.